U.S. News & World Report ranks Rider in the top tier of northern regional universities offering master’s degrees. My lab experience had a tremendous impact on me. It’s where I learned how to think creatively and critically about science. It definitely made me a better teacher. She also was excited at the ability to graduate with two degrees: a Bachelor of Science in biology and a Bachelor of Arts in secondary education. Throughout her four years at Rider, Jennifer worked in Dr. Julie Drawbridge’s developmental biology lab. She also became involved in the Science Learning Community, where she later mentored freshmen science majors. She also mentored students through the Summer Science Institute and tutored students throughout the year in biology, genetics and physics. “It showed me how students really learn and think. And, it helped to solidify my career choice,” she adds. Jennifer completed her student teaching at Princeton High School where she was later hired as a ninth grade biology teacher. “I’m very satisfied and am working in a great school district,” she says. As a Rider undergraduate, Jennifer was involved in four honor societies and nine clubs. She also served in eight leadership roles in these organizations. Jennifer had field experiences at five different middle schools and high schools and received a job offer shortly after graduation. 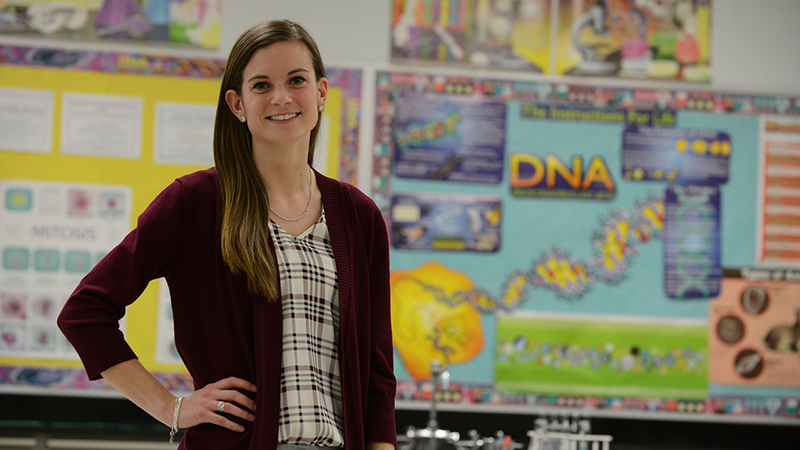 She’s now teaching ninth grade biology at Princeton High School where she completed her student teaching. "Rider had a tremendous impact on my career. It shaped me as a professional, a scientist and an educator."